One of the databases the library provides is HeinOnline, which delivers text of various publications and journals in PDF format. You can conduct a search or scan each journal, and available articles can be read immediately on your desktop. They are in the same format as the publication, which makes it simple for citing. You can also save them to your research files. If an article or edition is not available online, it will still appear in searches and you can contact your liaison. 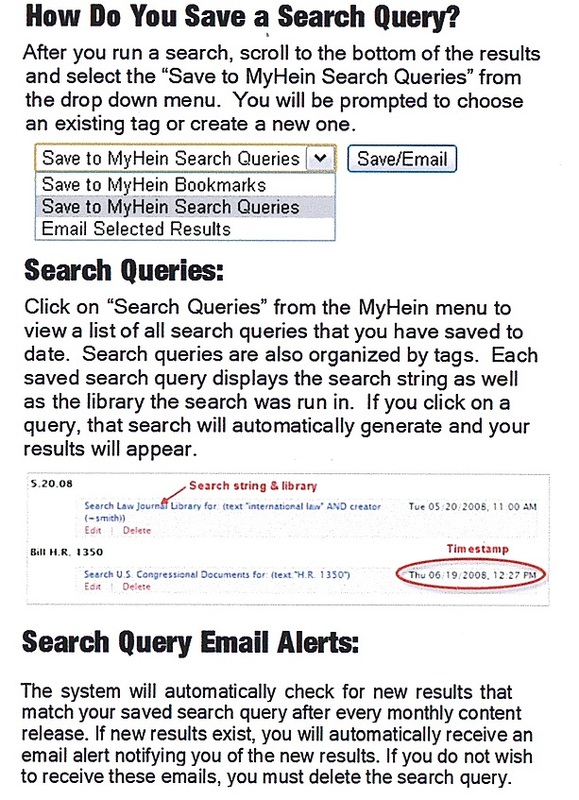 The library has worked with HeinOnline to make researching easier for you by arranging for alerts and saved searches. 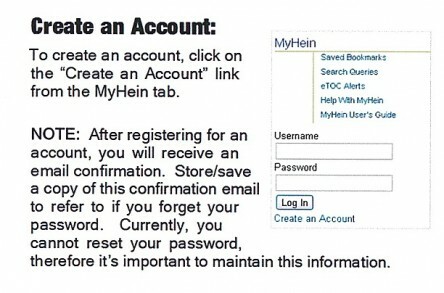 To take advantage of this convenience, you need to set up a free MyHein account. If you have questions about HeinOnline, including setting up an account, formulating searches, or finding a journal, see your liaison or Professor Melissa Serfass. 1. 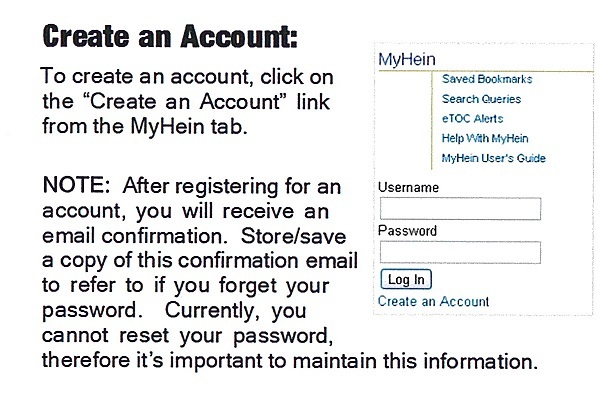 Go to HeinOnline in the library’s databases, and click on the MyHein tab. 3. 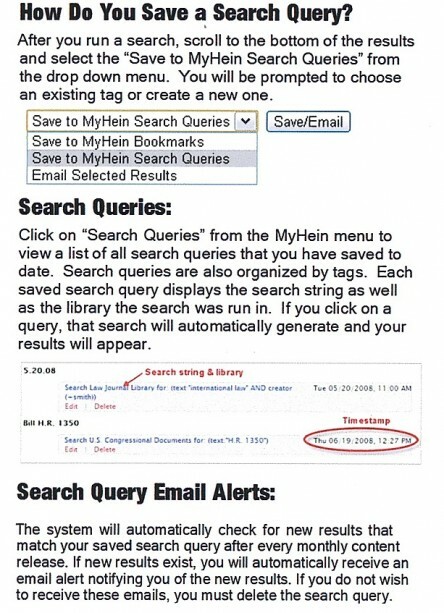 Run and save your search query. It will update every time new content is added to HEIN and will send you an email alert with links to new content. 4. 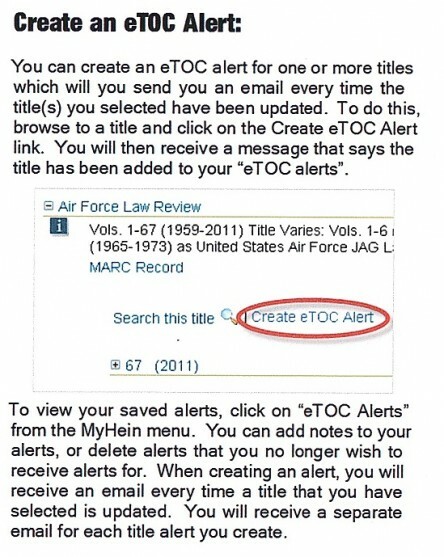 Or find your journal and create an eTOC alert. When the journal is updated, HEIN will send you an email with links to new content.